Last night The Voice treated us to the ‘Quarterfinals’ of Season 2. This week pitted four of Team Adam Levine’s singers against four of Team CeeLo Green’s singers. Did you watch the show? We did and we recapped it here for you! On last night’s episode of The Voice both coaches were obligated to immediately eliminate one of their team numbers. On Team CeeLo, James Massone was sent home and on Team Adam, Pip was sent home. On tonight’s episode one The Voice a member of Cee Lo’s and Adam’s teams will be eliminated. Left on Team CeeLo is Cheesa, Jamar Rogers and Juliet Simms. Left on team Blake is Katrina Parker, Mathai and Tony Lucca. The competition comes to an end tonight for two more artists. In the forth of six Elimination Shows, the artist who receives the most viewer votes on Teams CeeLo and Team Adam from the previous night’s Quarterfinal Performance Show, will be saved and guaranteed a spot in the Semifinals. The bottom two artists on both teams must each perform an additional last chance song in a fight for survival. 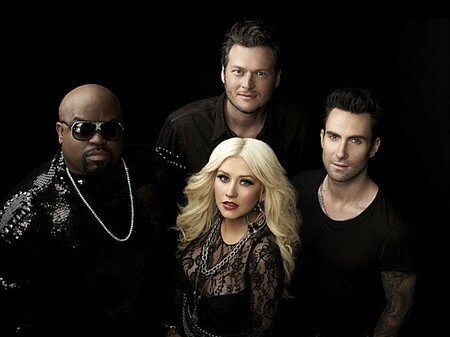 Coaches Adam Levine and CeeLo will then be put on the spot to save one more member of their team to move into the Semifinals, thereby eliminating the other artist. Florence + the Machine who performs her hit single, “No Light, No Light,” off her latest album, “Ceremonials.” Accompanying her will be the artists from Team CeeLo. We will be live blogging The Voice tonight with all the up-to-the-minute details at 9PM EST so make sure to come back to this spot and watch the show with us. Refresh often to get the most up-to-date results! RECAP: To help break up the tension from tonight’s live elimination show, The Voice has a special guest performance from Florence + the Machine to start the show. Last night on The Voice was in fact the best of the season thus far. If someone from Teams Cee Lo and Adam doesn’t end up winning, I would really be surprised. Adam reveals that he got hate mail and people tried to kill him for eliminating Pip last night. After America’s votes last night, on Team Adam, the person who received the most amount of votes is – Tony Lucca. This means that Katrina Parker and Mathai each will have one last chance to prove to their coach that they have what it takes to be saved. Time to find out who is going to be safe on Team Cee Lo, it is Jamar Rogers. Cheesa and Juliet Simms are going back stage to get ready to perform their last chance performance. Katrina Parker and Mathai will perform their last chance songs tonight. Cheesa and Juliet Simms will perform their last chance songs tonight. Adam is having a real hard time deciding who is going to stay and who is going home, although it appears that Katrina really blew him away, who does he pick to stay.. Katrina. It’s all up to Cee Lo, he has to decide who he is taking to the semi-finals, he chooses Juliette Simms.